In English, the verb “to be” is used to describe what something is or where it is, for example: “He is a student” and “He is at school”. In Japanese, the two are described very differently. The state-of-being we will learn is used to describe only what something is and not where it exists. While the previous dialogue may be fine among close friends, you should use the polite form when speaking to a teacher, a superior such as your boss, or people you’re not very familiar with. For nouns and adjectives, all that is required for the polite form is to add 「です」 to the end of the sentence. We did this in our simple self-introduction in the last section and because it’s understood by context that you are talking about yourself, there is no need to add a subject. We can ask questions in the polite form by further adding 「か」 to 「です」. The 「か」 is a question marker so a question mark is not necessary. Below is a simple greeting in the polite form. Here’s an example of a casual morning greeting between two classmates and a polite morning greeting with the teacher. You can follow a similar model to practice greeting people in the morning. We’ll learn the expressions for afternoon and evening greetings in the next section. Context plays a powerful role in Japanese so one word sentences are perfectly fine for simple question and answers. However, longer and more sophisticated sentences will consist of many words that perform various grammatical roles. In Japanese, the grammatical role each word plays in a sentence is defined by particles. Particles are one or more Hiragana characters that assign a certain grammatical function to the word that comes before it. We’ll see how this works by first learning the topic particle. As mentioned previously, context is very important in Japanese and is often silently understood by the situation. However, what you want to talk about may not always be obvious or you may want to change the topic of the conversation. For that purpose, the 「は」 topic particle is used to indicate a new topic for the conversation. The topic particle while written as 「は」, is pronounced 「わ」. (As for) this, what is (it)? (As for) that, (it’s) a pen. (As for) now, (I’m) a little busy. The topic particle is also used in the greetings for daytime and evening. The expressions were originally full sentences with a topic meaning, “As for today/tonight, how is your mood?” but they were eventually shortened to just “As for today” and “As for tonight”. Teacher: (As for) lately, how (is it)? The 「も」 particle used the same way as 「は」 topic particle but adds the meaning of “as well” or “also”. Lee: As for today, (are you) busy? Smith : Yeah, (I’m) busy. Smith: Tomorrow is also busy. Lee: What about the day after tomorrow? Smith: The day after tomorrow too. In Japanese, the word “you” is seldom used to refer to a person except in the case of very close relationships. Most of the time, you will refer to people using their name (last name is more polite than first) usually followed by a name-suffix. You have probably already heard 「さん」 somewhere at some point. It is the polite name-suffix used to refer to your social superiors, elders, or people you are unfamiliar with. The most common name-suffixes are listed below. If you’re not sure which to use to address someone, 「さん」 with the person’s last name is generally the safest option. You can also always ask the person what they prefer to be called by. Teacher: Smith-san, (are you) well? Teacher: Lee-san, (are you) well? Lee: Yes, (I’m) fine. But (I’m) sleepy. Smith: (It’s) ok. Lee-san is always sleepy. We already saw that it’s usually understood implicitly by context when you’re talking about yourself. However, there are times you may still want to refer to yourself as a topic to say, “As for me…” or “me too”. There are several options for referring to yourself depending on level of politeness and gender. John: As for pizza, tasty? Alice: As for me, tasty. This short conversation highlights a very important point. The topic only brings up the general topic of the conversation and does not necessarily indicate the subject of any one particular sentence. The last sentence 「私は、おいしい」 would be very strange if it meant “I am tasty”. However, because “I” is only a general topic, from the context of the entire conversation, we know that Alice is saying that as for her, the pizza is tasty. We’ve already encountered the honorific prefix 「お」 in 「お元気」. This prefix is used in all sorts of words and comes from a Kanji which can be read as either 「ご」 or 「お」. However, determining which reading to use is usually not an issue as this Kanji is usually written in Hiragana. The reason we’re looking at it here is because of how the honorific prefix is used to refer to family members. The basic idea is to use the honorific prefix when referring to somebody else’s family. You would not use honorifics to refer to your own family unless you are speaking to someone within your family. We will learn more about the concept of inner and outer circle for honorifics in a much later chapter. The list below is by no means complete and only covers the more common words for the primary family members. Yamada: Smith-san, are (you) Asian (person)? Smith: No. But, (my) mother is Japanese. Yamada: Is that so? As for (your) father? Smith: (My) father is American. Let’s add some life to our sentences by using sentence-ending particles. These particles are attached at the very end of the sentence to add an emotion or tone. 「よ」 and 「ね」 are two of the most frequently used sentence ending particles. 「ね」 is used when the speaker is seeking agreement and confirmation. It adds a tone similar to saying, “right?” or “isn’t it?”. 「よ」 is used when the speaker wants to point something out or make something aware to the listener. It adds a tone similar to saying, “you know?”. The two can be used together as 「よね」. As for today, (it’s) hot, isn’t it? As for tomorrow, (I’m) busy, you know. As for ramen, (it’s) tasty you know, isn’t it?! Smith: Nice to meet you. (I’m) Smith. Tanaka: Nice to meet you. (I’m) Tanaka. Smith: Tanaka-san, (are you) a student? Tanaka: No, (I’m) a teacher. Tanaka: It’s true, you know. Smith: (You) are very young, right? How old (are you)? We’ve already used some adjectives as the state-of-being but we have yet to describe a noun directly with adjectives. In order to do this, we first have to learn the two different types of adjectives in Japanese. There are two types of adjectives called i-adjectives and na-adjectives. All i-adjectives end in 「い」. All adjectives that do not end in 「い」 are na-adjectives. Though most adjectives that end in 「い」 are i-adjectives, there are a small number of na-adjectives that end in 「い」. The examples below are some of the most common na-adjectives that end in 「い」. You can easily describe a noun by placing the adjective directly in front of the noun. For na-adjectives, you first need to add 「な」 before you can attach the adjective to the noun (hence the name). Smith: Is Tanaka-sensei a new teacher? Smith: (She’s) a very pretty person, isn’t she? As opposed to polite speech, which is mostly gender-neutral, casual speech has many constructions that make it sound masculine or feminine to varying degrees. Of course, you do not have to be a specific gender to use either masculine or feminine manners of speech but you do need to be aware of the differences and the impression it gives to the listener. The first example of this is how 「ね」 and 「よ」 are used in casual speech. The declarative 「だ」 is attached to nouns and na-adjectives to give it a more declarative tone and make the state-of-being explicit. This is important in some grammatical forms we will cover later. For now, we can use it in casual Japanese to give a more definitive, confident, and somewhat masculine tone (though females often use it as well). For males, in particular, it is important to use it before 「ね」 or 「よ」 to avoid sounding too feminine. Note: Only attach 「だ」 to nouns and na-adjectives. Never to i-adjectives. Alice: Morning, how are (you)? Alice: But (it’s) already afternoon, you know. John: Is that so? Then, good afternoon. Alice: As for homework, (is it) difficult? John: Umm, (it’s) probably difficult. Because John is male, he decides to use 「だ」 with 「よ」 with the na-adjective 「簡単」. However, regardless of gender, you cannot use 「だ」 with i-adjectives so he says 「難しいよ」. 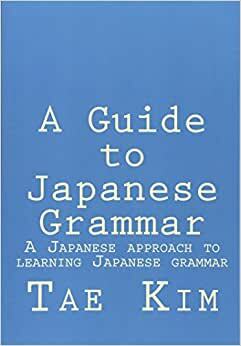 「難しいだよ」 is grammatically incorrect. The 「の」 particle has many different uses but one of the most basic usages is for describing nouns with other nouns similar to how we described nouns with adjectives. This is usually used to describe ownership, membership, property or any other description that involves another noun. It is important to remember the order the modification takes place. You don’t want to inadvertently say “name’s me” when you meant to say “my name”. If you’re unsure of the order, I recommend translating 「の」 as “of” and reading it in reverse. Name of me (my name) is Kim. This car is car of Japan (Japanese car). Pen is above of desk. Bag is below of desk. Tanaka-sensei is teacher of Japanese (Japanese teacher). Lee: What is Smith-san’s first name? Smith: What is Lee-san’s first name? The 「の」 particle can also replace the noun entirely when it’s understood by the context. (I) like the red one. Because the state-of-being is implied within nouns and adjectives, expressing the negative is a bit different from English. The noun or adjective is conjugated directly to say that [X is not Y]. Conjugating nouns and adjectives into the negative is done through two simple rules. There are only two exceptions to the rule for i-adjectives both involving the adjective meaning “good”. The words 「いい」 and 「かっこいい」 (which is a combination of another word 「格好」（かっこう） with 「いい」) originally come from the adjective 「良い」（よい）. Though it is usually pronounced 「いい」 in modern Japanese, all conjugations still derive from the original 「よい」 reading. You will see similar examples later as we learn different types of conjugations. Note: The negative form is very similar grammatically to i-adjectives. Similar to i-adjectives, you must never use the declarative 「だ」 with the negative. As for salad, don’t like very much. As for steak salad, (it’s) not salad, you know. As for this book, (it’s) not interesting, you know. As for this year’s winter, (it’s) not cold, is it? John: Yamamoto-sensei’s class is not very interesting. Alice: As for me, (it’s) interesting. John: But isn’t it very difficult? Alice: That’s a good thing. John: It’s not good at all! As before, all that’s required for the polite form is to add 「です」 to the end of the sentence. Yamamoto: What is your hobby, Lee-san? Lee: Computers. (I) also like games. Yamamoto: Do (you) like sports? Lee: No, I don’t like (it) that much. Smith: Lee-san is an otaku. With the 「は」 topic particle, you have to know what you want to talk about ahead of time. Obviously this will not always be the case. For example, if you wanted to know what kind of food somebody liked, it would be impossible to ask if each kind was his/her favorite using the topic particle saying “as for this” and “as for that”. That is what the 「が」 particle is for: to identify or seek to identify an unknown. As for pizza, do (you) like it? You can sometimes restructure your sentence to mean the same thing with and without the 「が」 particle. As for food that (you) like, what is it? However, while the topic particle can only bring up a general topic of conversation, the identifier particle plays a specific role in that it’s identifying a particular thing among other possibilities. Smith-san is the one that is busy. Which teacher do you like the most? Lee: As for John-san, which teacher do (you) like the most? Lee: That’s so, isn’t it? She is cute. But (she’s) second-year teacher. John: Looking forward to next year! Alice: As for me, I like Yamamoto-sensei, you know? Alice: Isn’t (his) class interesting? John: It’s not interesting! It’s difficult! Though it doesn’t work all the time, a simple trick to easily distinguish 「が」 is to translate it as “the one or thing that…”. This way, it clearly illustrates the 「が」 particle as identifying a particular thing or person. Tanaka-sensei is the one that (I) like. Isn’t (his) class the thing that is interesting?